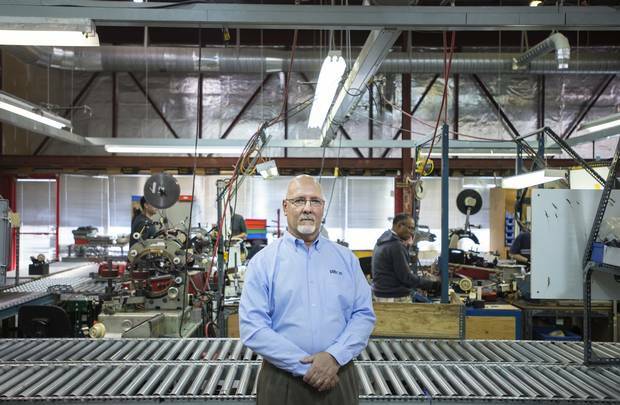 Steve Nolan, vice-president of Plitron Manufacturing Inc., is a baby boomer with succession planning on his mind. This is part of The Globe and Mail's week-long series on baby boomers and how their spending, investing, health and lifestyle decisions could affect Canada's economy in the next fifteen years. Is Canada ready for the boom? Steve Nolan has some baby boomer problems at his doorstep. And he's one of them. The 58-year-old vice-president at Plitron Manufacturing Inc., a Toronto-based maker of transformers, is overseeing the day-to-day operations of a firm whose 55-strong staff has many key employees closing in on retirement, including senior engineers whose skills and experience will be hard to replace. The factory floor has workers getting on in years, too, including one man well into his 70s who has eschewed retirement to stay in the job he loves. The reality of an aging work force means "succession planning is becoming more and more important for businesses," he says. "It's not just at the CEO level. We've become leaders in the field in our technology. It takes time – you're not going to get someone out of school who possesses the knowledge that our people have. It takes some planning." And soon, that planning will include replacing himself. "In the next three or four years, I'll hire my replacement, or groom my replacement from within," he says. "My goal is to leave the company in a much stronger place, with a very good, sustainable future." Stefan Slave works on the factory floor at Plitron Manufacturing Inc., in Toronto on Nov. 2, 2015. But reaching that goal is a challenge not just for Mr. Nolan, but for the entire Canadian economy, as the biggest demographic wave in the country's history hurtles into retirement. The baby boomers – that massive bubble of people born in the two decades following the Second World War, perhaps the most important cohort for economic, technological and social development in human history – have begun the transition into old age and, inevitably, death. Baby boomers are the generation born in the two decades following the Second World War. Statistics Canada defines baby boomers as those born between 1946 and 1965, which means they currently range in age from 50 to 69. This is the definition The Globe and Mail has used for stories in its boomer series to ensure data match the most commonly used national statistics. The result will be a dramatic greying of Canada's demography – one that has serious implications for the national economy, government policy and the well-being of its citizens. Without significant adjustments, we could be headed for decades of anemic economic growth, shrinking per capita incomes and eroding wealth. Governments could face skyrocketing deficits and tough choices about what kinds of health care and social supports we can afford, as a smaller pool of taxpayers must fund the rising costs of the growing numbers of seniors. The gaps between the wealthy and poor may widen into gaping social wounds, as the adequacy of pensions and private savings are tested to their limits. And the grey shift has already begun. As of this year, for the first time, Canada has more people over the age of 65 than under 15. The age group that now encompasses the boomer generation – 50 to 69 – makes up 27 per cent of the population, compared with 18 per cent in that age group two decades ago. The number of people over 65, the traditional retirement age in this country, make up 16 per cent of the population – double their proportion in 1971. And that's set to grow much more, and quickly. So far, only 18 per cent of the boomer generation has reached 65; the peak of the baby boom won't reach that age for another decade. By then, more than 20 per cent of the national population will retirement-aged; by the mid-2030s, it will be closer to 25 per cent. While the baby boomers will retire with generally better health, a longer life expectancy and more wealth than any generation before them, the move of such a large population group from producers in the economy to consumers and, ultimately, dependents, will create a gaping hole in Canada's economic fabric. Our policy makers haven't yet come to grips on how to fill it – even though experts have been talking about this demographic inevitability for decades. "We've known for a long time that this was coming. But it's very hard to get folks to move ahead of time," says David Dodge, a former governor of the Bank of Canada who has studied the economic implications of demographic trends since his student days. "Now, we're sitting knowing that we have a mountain to climb." The biggest challenge for the Canadian economy – as well as those of most major Western countries whose populations are similarly maturing – is that the looming retirement of the boomer generation amounts to a giant brake on the labour force. Labour growth is the key ingredient in the production of more goods and services that adds up to economic expansion. And it is now face to face with a massive and irreversible demographic threat. "Inevitably, the aging of the population, with more and more people exiting the work force either full-time or part-time – labour force growth slows down," said David Foot, economics professor at the University of Toronto and author of the 1996 bestseller Boom, Bust & Echo, the seminal work on the economic influence of the boomer generation. "And since labour [growth] is two-thirds of economic growth, inevitably economic growth slows down. So as we look forward, much slower economic growth will be the norm." After peaking at 4 per cent in the 1970s and averaging 1.6 per cent in the 2000s, Statscan projections suggest the labour force will grow by only about 0.5 per cent a year in the 2020s. Forecasters say this labour stagnation will likely keep real economic growth below 2 per cent annually over the next decade, below the average of about 2.5 per cent over the past quarter-century. Some of the impact of Canada's aging work force will be mitigated by its relatively large immigration program: About 250,000 new immigrants arrive in Canada each year, roughly double our country's natural growth through births and deaths. (On a per capita basis, Canada accepts about twice as many immigrants as the United States, and about four times as many as Japan.) But even with current levels of immigration, we're having trouble keeping up with even the first wave of retiring baby boomers. The number of new retirees in Canada has jumped from about 170,000 annually five years ago to nearly 250,000 today. Within a few years, we face retirement rates closing in on 400,000 a year. "You can't use immigration alone to solve the aging work force problem," Mr. Foot says. For many experts, then, the second key to tempering the slowdown in Canada's labour force is something that has already been happening as the boomer generation enters its senior years: Unprecedented numbers of older workers are staying in the workplace for longer than ever before. In the past decade, the number of Canadian workers over 65 has spiked more than 140 per cent; the number of workers over 55 has surged 67 per cent, to more than 3.7 million. The labour force participation rate (the number of people either working or seeking to work as a percentage of the population) for people over 65 has nearly doubled, to almost 14 per cent, while participation in the 60-to-64 group has jumped 10 percentage points, to nearly 55 per cent. Of course, that's still a long way from participation of the so-called "prime working age" population, from 25 to 54, which is north of 85 per cent. At that rate, experts say, we're already at or very near the realistic ceiling of labour contribution from the prime-age group. A key to keeping the labour market adequately supplied in the coming decade or so will be finding ways to keep the rising trend of seniors' participation going. "Employers are going to have to be flexible," says economist Philip Cross, former chief economic analyst at Statistics Canada. "Older workers really like working part-time. They also like being self-employed … You don't want to be tied to your desk for 37.5 hours [a week] for 50 weeks a year." Experts also agree that mature Western economies could overcome the growth headwinds from their aging demographics by stepping up innovation and productivity – using technological and efficiency advances, and investing in upgraded facilities and equipment, to expand the per-worker productive capacity. On that front, Canada has a lot of room to improve. Our labour productivity rate – the amount of economic output produced per hour worked – is 25 per cent below U.S. levels, and is below average for G7 countries. The World Economic Forum's Global Competitiveness Index ranks Canada only 22nd in the world in innovation, including a discouraging 27th in private-sector research and development. "If you continue with our miserable productivity record, then you will at some point have falling incomes per capita," Mr. Dodge says, a consequence of having a smaller proportion of the population producing goods and services in support of a growing proportion of non-producing people. "If you're going to keep incomes up from everybody, they have to rise even faster for those who are actually in the labour force." The waves of retiring baby boomers are putting governments in an increasingly uncomfortable fiscal squeeze. On the one hand, the boomers' exit from the labour force will slow economic growth, eroding the tax base and eating into government revenues. Meanwhile, this growing bulge of seniors needs and demands more from their governments – most notably, health care and income support programs, such as Old Age Security. Health care spending in particular increases significantly for people 65 and older. The result is that boomers are putting intense and growing pressure on government budgets. The provinces in particular generally aren't prepared for what's coming, warns Don Drummond, a former senior federal Finance official and Toronto-Dominion Bank chief economist. "The potential growth rate is about to come down fairly sharply in Canada. Almost all forecasters have missed that," says Mr. Drummond, now a visiting scholar at Queen's University. In a recent study for the Centre for the Study of Living Standards, Mr. Drummond and two research colleagues estimated that Canada's economy will grow an average of 1.6 per cent a year from 2014 to 2038, well below the 2-per-cent pace experienced from 2000 to 2014. "People tend to think of demography as slow moving," he says. "It's not, and particularly not over the next 20 years. It's moving very rapidly." Note: The figures for the territories for 2000-14 are actually 2000-13. Slower growth drops directly to the bottom line for governments, dramatically slowing the pace of expansion of the tax base. Unless governments raise taxes substantially to counter the trend, provincial revenues will grow at roughly 3.5 per cent a year over next 10 to 20 years, according to Mr. Drummond. That's down from revenue growth of 4.5 per cent to 6.5 per cent from the mid-1990s to 2008. "That's quite a different world, just on the revenue side, flowing from lower economic growth," he points out. This all coincides with an equally unfavourable spending outlook. In nearly all provinces, spending growth is likely to outstrip revenues in every province except Manitoba and British Columbia. The provinces east of Ontario will be hit hardest by this looming squeeze, while the West will manage better. Worst off will be New Brunswick, which is expected to have the slowest potential growth rate and the highest pension and health care pressures, Mr. Drummond says. "The provinces are grossly overestimating growth and underestimating health-care pressures," he adds. The fiscal squeeze also raises troubling questions about inequity between generations. The boomers generally did very well while they were in the workplace, earning higher inflation-adjusted wages than Generations X and Y, and enjoying better pensions and benefits. These younger workers are being saddled with the task of paying for rising spending needs, mainly in health care, which are eating nearly half of provincial budgets. "We built this government machine that takes tax revenues from everybody and gives them disproportionately to this growing population of older people," says McGill University economist Christopher Ragan, who worked as a special consultant at the federal Finance department from 2009 to 2010, focusing on the fiscal implications of aging. "These components aren't fully funded," he says. The demographic forces are so powerful that governments must deal with the problem of rising health-care spending now, either by raising taxes or curbing costs. Future generations should not be expected to subsidize health care for baby boomers, he argues. "We have to recognize that there is this issue, and the issue isn't going to go away," he says. "We have time to think about it, but it involves some difficult choices." The C.D. Howe Institute has gone a step further by tallying the present cost of maintaining demographically sensitive government programs, such as health care, over the next 50 years. The total "implicit liability" is nearly $4.3-trillion, or $120,000 per person across Canada, with most of the burden – $107,000 – falling on the provinces. "It's an arithmetic problem," explained Alexandre Laurin, director of research at the C.D. Howe. "It's similar to the Canada Pension Plan. Younger workers are going to be paying more to get the same thing." The good news is that there are ways to counter the ticking demographic time bomb. The most obvious way is to curb spending growth, raise taxes, or both. Bolstering the labour force, through increased immigration and keeping more seniors working, would prop up growth and the tax base. Productivity gains would help, too. Another potential saviour for governments is the roughly $3-trillion socked away by Canadians in registered retirement savings plans and employer-sponsored registered plans. Governments will tax these assets as they are withdrawn by retirees. "Once the baby boomers start retiring, more of these deferrals will be taxed. It means more and more revenues [for governments]," Mr. Laurin said. Meanwhile, analysts have spent years studying and reshaping public pension plans to ensure they can withstand the double hit of a boomer onslaught along with rapidly rising life expectancies. Canada Pension Plan contributions were raised significantly between 1997 and 2003, for example, to ensure the worker pension plan could generate enough income to cover future needs. The Canada Pension Plan Investment Board now manages a $269-billion investment fund created to help finance future benefits. It is forecast to grow to $800-billion by 2040. Canada's chief actuary, Jean-Claude Ménard, has estimated the fund needs to earn long-term real returns of 4 per cent annually after inflation to cover its obligations over a 75-year projected time frame. CPPIB says it has earned an annualized average return of 8 per cent – or a 6.2-per-cent real return after inflation is accounted for – over the past 10 years, which puts it safely ahead of target so far. Bill Robson, CEO of the C.D. Howe Institute, says CPPIB has been "making out like bandits" in recent years, earning an investment return of 18.7 per cent in fiscal 2015 alone. But he still questions whether it can continue to earn needed returns over the longer term if interest rates remain low. "If I knew where I could get a real return higher than 4 per cent right now on my savings, I'd mortgage everything I have and invest everything in it," he says. At least CPP has a clear funding strategy. The universal Old Age Security (OAS) benefit paid to all seniors, as well as the supplemental Guaranteed Income Security (GIS) plan for low-income seniors, are paid entirely from annual federal government tax revenue. Projections forecast federal OAS and GIS costs to rise from $47-billion in 2015 to more than $100-billion by 2031. But pension researcher Robert Brown, who has studied the impact of shifting demographics on Canada's social security programs, says the OAS cost increases should be manageable if the economy achieves modest growth because tax revenue will also grow over that period, helping absorb much of the impact. OAS costs are expected to rise from 2.38 per cent of Canada's GDP in 2015 to a peak of 2.77 per cent in 2030, then fall back to 2.37 per cent of GDP by 2050 as the boomer generation dies, according to chief actuary forecasts. "These numbers do not destroy a country – OAS is affordable," Mr. Brown says. The biggest current debate about retirement planning is not the fate of CPP or OAS, but how well boomers themselves will be able to finance their retirement years beyond the minimum floor of support provided by government programs. The decline of workplace pension plans means just 24 per cent of private sector workers are now covered by a plan, leaving most people on the hook to fund their own retirements. An era of low interest rates hasn't helped that task, as investment returns on retirement savings have been tepid for years. "Low interest rates are only good in an economy with lots of young people looking to borrow and spend," said Mr. Foot, the Boom, Bust & Echo author. "They're a disaster in economies where you have boomers saving for retirement." The outcome will inevitably be mixed, with many boomers living comfortably and many others struggling with a far lower standard of living. Gisele Bouvier is already struggling at age 65. She was laid off from her information technology job in the federal government at age 62 and ate through a big part of her savings as she waited to collect OAS and CPP benefits this year. Now living on $26,000 in annual income – half of which goes toward rent on her Ottawa duplex – most optional spending like cable TV and Internet service is out of reach. She listens to a lot of radio and volunteers her free time to work with anti-poverty group Acorn, which tries to secure affordable house for low-income earners. "I see poverty ahead of me," she says. "You worry for the future. You live with this worry, and you say, 'Oh well, maybe I won't live that long.'" University of Ottawa retirement researcher Michael Wolfson says his research suggests half of Canada's middle-income earners will face a significant drop in their standard of living when they retire. He worries governments are not taking a "holistic" look the issue, considering the effects on social assistance, subsidized housing, drug costs and long-term care demands when a large proportion of boomers faces financial problems in retirement. Other researchers, however, say the effect will be less severe. A private sector study earlier this year by McKinsey & Co., for example, suggested 83 per cent of Canadians will have enough to maintain their current lifestyle in retirement. McKinsey said the groups most at risk of big drops in lifestyle are mid- to high-income earners without workplace pension plans, especially those with low savings. Low savings levels are not an isolated problem in the boomer demographic. An Ipsos Reid survey of 12,000 Canadians in 2015 shows 49 per cent of people 55 to 64 say they have saved less than 10 per cent of their retirement target to date, while household debt levels average $71,815. At age 56, Wayne Hassar is keenly aware of his remaining debt. The Winnipeg-based insurance analyst's plans to retire at 60 hinge on his ability to finish paying his mortgage while ensuring he has enough saved for his two teenaged sons to go to university. "We still have a mortgage, that's the elephant in the room for sure. That has to be paid off or the plan will not happen," he says. "What really counts is innovation, technology, the organization of business, the expansion of human capital, and the animal spirits of capitalism," wrote author Chris Farrell in his 2014 book Unretirement: How Baby Boomers are Changing the Way We Think About Work, Community and the Good Life. "In other words, productivity trumps Malthusian demographics." Andrew Violi, president of Mellow Walk Footwear Inc., a Toronto-based manufacturer of safety shoes, is an example of that kind of thinking. "When I joined the family business 10 years ago, the average age of our work force was older and our machinery more manual, requiring skilled operators," he says. He responded by upgrading to more modern machines that "de-skill and simplify the set-up," and by training "a new generation of shoemakers," many of whom come from the ranks of new immigrants. "Frankly, I was more concerned about this a few years ago," he says. Baby boomer's dilemma: When to start collecting CPP?